The IPSI Secretariat wishes all IPSI members and friends the warmest season’s greetings as another year comes to an end. This year has been a busy one for both the Secretariat and our partners all around the world, with our partnership having grown to 202 members, and the quantity and quality of collaboration between members continuing to improve. We at the Secretariat have a lot planned for 2017 as well, and we look forward to working with all of you next year and into the future. 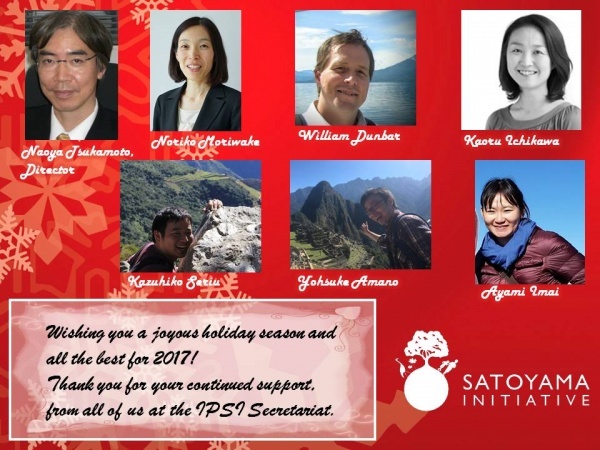 In addition to season’s greetings, we would like to share an update on the interim review of the IPSI Plan of Action 2013-2018, an initial report of some of our activities at the UN Biodiversity Conference in Cancun, Mexico, plus two calls for submissions: one for the next volume of the Satoyama Initiative Thematic Review, and one for Life Beyond Tourism’s next General Assembly. We also have an update on the latest edition of the COMDEKS Project’s newsletter, and an introduction to one of IPSI’s newest members, the Green Islands Foundation. As always, we hope you will contact us to submit any new case studies or other information about your activities, or if you have any questions or comments. Once again, we wish you the best for the coming year, and we look forward to hearing from you regarding all of your activities supporting Socio-ecological production landscapes and seascapes (SEPLS). Season’s Greetings from the IPSI Secretariat! The staff of the IPSI Secretariat, and all of us here at UNU-IAS in Tokyo, Japan wish you the warmest greetings for the holiday season, and the best of success in the coming year. As many readers are aware, the IPSI Secretariat, in close consultation with the IPSI Steering Committee and with support and inputs from the IPSI membership, has been carrying out an interim review of the IPSI Plan of Action 2013-2018 as required in the document. After carrying out a questionnaire survey and discussions at IPSI-6 and other venues, an initial draft report was submitted to the Steering Committee at their eleventh meeting in Hyogo, Japan in November 2016, and after a final round of comments and inputs, a final draft is expected to be ready in early 2017. We hope all IPSI members will take time to read the final report when it is finished and made available on the IPSI website. We look forward to working together with all of you to continue to make IPSI the most effective partnership possible. We would like to express our sincere thanks to the co-organizers of these events and everyone who took part in them. We will also include a full report on IPSI activities and outcomes of the conference in an upcoming newsletter. The United Nations University Institute for the Advanced Study of Sustainability (UNU-IAS) and the Institute for Global Environmental Strategies (IGES) recently announced a call for papers for the third volume of the series “Satoyama Initiative Thematic Review”. The third volume will feature the theme “Livelihoods and socio-ecological production landscapes and seascapes (SEPLS)”. Authors from IPSI member organizations who have case studies relevant to this theme (see below) are highly encouraged to submit a manuscript following the guidance provided in this call for submissions. The initial deadline for abstract submissions is 15 January 2017. Please see the full call for submissions on the IPSI website here. IPSI member The Romualdo Del Bianco Foundation – Life Beyond Tourism recently announced a call for abstracts for their 19th General Assembly, which this year has the theme “Smart Travel, Smart Architecture, Heritage Conservation and its Fruition for Dialogue” and will be held 11-12 March 2017 in Florence, Italy. IPSI members with proposals related to the theme are highly recommended to submit them. The deadline for submissions is 20 December 2016, so please act as soon as possible if you would like to submit. For submission details and instructions, please see the full call for abstracts on the Life Beyond Tourism webpage here. The Green Islands Foundation (GIF) is an environmental NGO based in Seychelles, functioning as a coordinator of local environmental initiatives, seeking to bridge the gap between the private sector and national environmental programmes. To achieve its mission statement, “to Promote the Mainstreaming of Sustainable Development in Seychelles”, GIF builds partnerships with other NGO’s, private partners and government. Established since 2006, its initial focus is on tourism operations and production landscape management with the aim to place equilibrium and potential synergies of development and environment at the core of its operations. 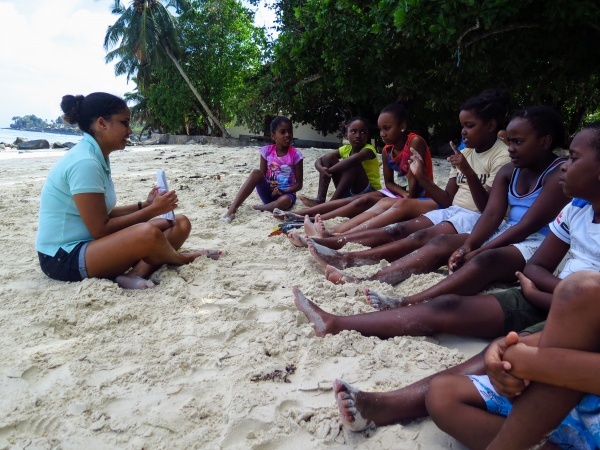 GIF’s main activity is providing scientific and technical assistance to Private Island environmental programmes, supporting their conservation initiatives and sustainable development of the island resorts such as island restoration and rehabilitation. Next to this, GIF has a portfolio of projects directed at enhancing biodiversity conservation and the sustainable use and management of coastal zones. This ranges from small projects directed at developing practical tools and promoting environmental education, to large projects investigating different scenarios for management of marine areas. For more information, please see Green Islands Foundation blog here.